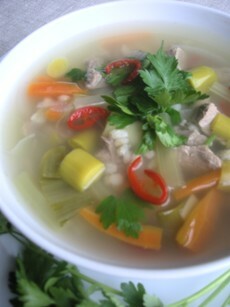 This vegetable beef barley soup recipe is an easy but slow cooker beef and barley soup recipe. This beef vegetable soup recipe is both hearty and filling and can make a meal on its own. This is one of the vegetable beef soup recipes which can be cooked in 2 ways: cook slowly for a long time on the hob to tenderise the ingredients or put the meat and water into a pressure cooker, bring to the boil and skim the surface. Add the remaining ingredients, put on the lid, bring to a high (15 lb) pressure and cook under pressure for 25 minutes. If you make this vegetable beef barley soup the day before needed, the soup can be allowed to cool so the layer of fat can be removed from the top and calories reduced. Diabetes Appropriate, Low Calorie, Low Saturated Fat, Heart Healthy, Healthy Weight, Low Carbohydrates, Low Sodium, Dairy Free. Cooking time: on a hob – 2 hours; in a pressure cooker 30 min. If you like it spicy: 1 chilli pepper seeded and chopped and 3 cloves of garlic peeled and chopped. Put the meat in the saucepan, cover with 2.3 liters (4 pints) of water, season to taste and bring slowly to the boil, skim the surface. Cover and simmer for 1 ½ hours. Add the vegetables and barley. Continue to simmer, cover until vegetables and barley are cooked. Add chillies and garlic at the end. Skim off the fat and serve the soup hot, garnished with chopped parsley.